Make Your Spring Training Trip a Home Run! Spring Training is just around the corner and now is the time to start planning so you don’t strike out on tickets, hotel stays and more. 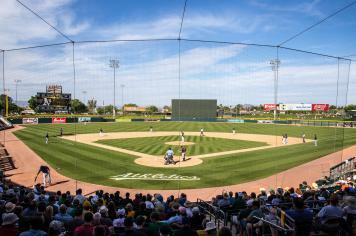 Whether you are cheering on the World Series Champion Chicago Cubs, or rooting for the Oakland A’s you’ll want to stay and play in Mesa for your Cactus League Spring Training trip. Tickets are already selling out quickly for games, so purchase yours now to land an action-packed seat right behind home plate or a spot on the lawn to sprawl out on a blanket. Visit here for Cubs tickets and here for A’s tickets. Sheraton Mesa Hotel at Wrigleyville West: The Official Spring Training Headquarters for the Chicago Cubs, this hotel features Stats Sports Grill which has 20 local and domestic craft beers on tap and 22 TV’s with access to every sports channel. Excellent shopping and dining can be found next door at Mesa Riverview…oh and did we mention that the hotel is only a couple steps away from Sloan Park? Cubs fans hit a grand slam by staying here! Hilton Phoenix/Mesa: Just four miles from the A’s spring training stadium the Hilton Phoenix/Mesa keeps sports fans close to the action. This signature hotel features 260 newly-renovated guest rooms and offers convenience with complimentary self-parking and shuttle services. You’ll feel as if you’ve stolen a base with all of the amenities offered. Phoenix-Mesa Marriott: Traveling to Mesa, Arizona, without a car is a breeze with the Metro Light Rail connecting downtown Mesa to greater Phoenix. From Sky Harbor International Airport, simply hop on the PHX Sky Train and take the east-bound train to downtown Mesa. The new route takes visitors in front of the award-winning Mesa Arts Center and is just steps away from the Phoenix-Mesa Marriott. More on Mesa transportation here. Authentic Chicago flavor at Sloan Park: Vendors at Sloan Park do a pretty good job at making your stomach think you’re actually at Wrigley Field by offering up some of Chicago’s finest: Chicago-style pizza with Giordano’s Stuffed Pizza and Chicago-style hot dogs with the Windy City Dog—classic fixings included. Imagery of celebratory A’s moments: A’s fans will enjoy celebrating great players and reliving impactful moments in A’s history by viewing large images and murals in Hohokam stadium. The images can be seen lining the top of the stadium’s third base-side façade and along the walls of the concourse behind the grandstand. Keep your trip going into extra innings by exploring all that Mesa has to offer in between ball games. Enjoy a local brew: Mingle with the locals before or after the game at one of the favorite spots for a cool, craft beer. Figure your way around the various breweries on your own or hop on a guided brewery tour with Arizona Brewery Tours. You’re here for the baseball, but you’ll stay for the brews. Family-fun for everyone: Kids of all ages will enjoy roaming with the dinosaurs at the Arizona Museum of Natural History or getting hands-on and creative with science at the i.d.e.a Museum. Families can also enjoy food and games at Amazing Jake’s Food & Fun which features bumper cars, glow bowling and redemption games. For more family activities click here. Get acquainted with nature: Those who thrive on outdoor adventure can enjoy a variety of hiking trails (ranging from easy to difficult) and scenery at Usery Mountain Regional Park and Lost Dutchman State Park. Take in the beauty of the Sonoran Desert without breaking a sweat aboard the Desert Belle on Saguaro Lake. Narration cruises will provide you with interesting facts about your surroundings, or sing along with their live music cruises. We want to see you cheering on your favorite ball team in Mesa this season. 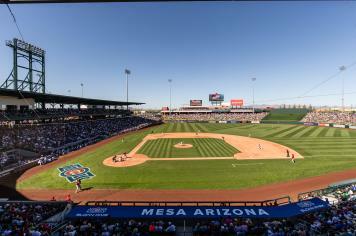 Include #VisitMesa on your Spring Training social media posts.